We all need a dress we can really depend on. One that we know is there for us on days we feel like we’re on top of the world and the days when you’d rather just not get out of bed, but dammit, you have to. Enter The A-Line. Sleeves, pockets, easy silhouette, and soft fabric make this dress a true winner. This dress comes in 2 lengths. The long length is 4" longer than regular. Too long? Don't forget our Alterations Credit. Kristin wears an XS (Regular) in this dress. She is 5'8" and wears a size 2/4 in dresses. Samira wears an M (Long) in this dress. She is 5'11" and wears a size 8 in dresses. Katie wears an L (Long) in this dress. She is 5'10" and wears a size 10 in dresses. - Product Care: Easy - machine wash cold and air dry. Sizing Notes: This dress fits true to size. If you prefer a looser, boxier fit, order one size up. Want to get the right size the first time? We're here to help! Email us your bra, denim, and dress size (ex. 34C, 28, 6). This guide is specific to The A-Line. Measurements are taken with the item laid flat, from seam to seam. 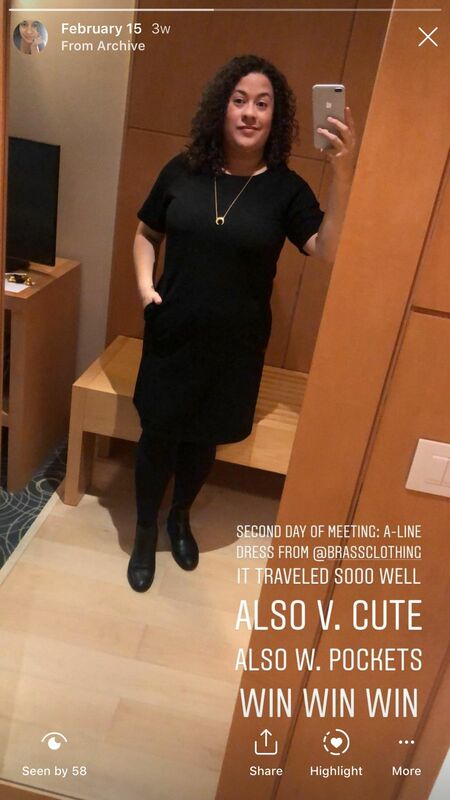 I caved and finally ordered several styles of dresses and tops because I've been eyeing their polished basics for a while now, and I thought I would fall in love with the Essential Dress so I tried it on first. It didn't work for me, and I looked at the rest of the pile of clothes sadly, thinking I was going to return everything. I was beyond thrilled when I pulled this dress on and it fit me perfectly, hugging where it should, skimming where I wanted it to, and the length and fabric weight were perfect. It's like wearing a super polished sweatshirt dress, and I can wear it with tights, with boots, with booties, or just with flats. I loved both the light gray and the navy colors, and I hope more colors will be made over the years. Thank you for such a perfect work dress! For reference- athletic build (wide shoulders and slim hips), 5'3, 130#, 34D, usually around a size 4/6 and the Small was perfect. For years I have been searching for a dress to wear as a “uniform” to work! I hate the stress of picking out clothes I’m not comfortable in each morning or getting mad when a certain sweater isn’t clean. This dress is all I need! I work in a business casual setting and this dress is perfect. I have 5 and wash them every week. After over a month, they are holding up well from repetitive wear. I am 5’6” 150 lbs. I have a long torso, so I bought a M, Long & it’s perfect! The dress hits just above my knees. I bought this dress for a work trip and it did not disappoint. The dress is great quality fabric - heavier than I expected but in a good way. It also had enough stretch to move around comfortably but not so much where it looked too worn at the end of the day. The best surprise was the dress traveled nicely and came out essentially wrinkle free from my suitcase. It’s become my go-to for any work trip. It’s even comfy enough to wear on the plane ride home. I bought this initially in the navy ponte at a sample sale, and months later bought the black. This dress is so easy to wear no matter the season. With or without tights. The pockets are perfect! This dress is great. Comfy, professional, good on it's own or with a blazer, fun color, fits great. I'm a big fan.